eatingforexcellence | my journey towards a balanced and healthy lifestyle! my journey towards a balanced and healthy lifestyle! Water is great, but sometimes I need a little flavor boost. The perfect solution? Skinny water! They were nice enough to send me six different flavors of their waters for me to taste & review for you guys. Thank you Skinny Water! Flavor – We use natural flavors found in fruits and vegetables. There is ZERO sugar in Skinny Water®. We use a very small amount of Sucralose and Ace-K as our sweeteners. There are ZERO calories, ZERO carbs, and ZERO sodium. No preservatives. Color – All Skinny Water® colors come naturally from several different fruit and vegetable sources. I’m sometimes skeptical of the zero calorie stuff because I don’t want to be putting fake & artificial ingredients into my body, but after researching Skinny Water, I knew that it was something that I could put into my body. Yay for natural flavors! I got to try a bunch of different flavors such as acai-grape blueberry, goji fruit punch, raspberry pomegranate, and more. I loved how they weren’t your “typical” flavors & they all tasted great. Look at all those flavors! It looks like a rainbow. These were perfect for when I needed a little boost & was thirsty, but tired of just plain water. I highly recommend these & I can’t wait to try all of the other flavors! For more information on Skinny Water, you can visit their website. Also make sure to follow them on twitter & like them on facebook. Disclaimer: I have personally reviewed the items above. My opinions are entirely mine. I never thought I could be so in love with nut butters. They are honestly the best thing that ever happened to this planet. Artisana kindly sent me some of their butters to try & I absolutely fell in love. I was sent a variety of their single serving packets of all the different nut butters they offer, along with a small jar of their almond butter & coconut butter. EVERYTHING WAS SO GOOD. How great do those look? I enjoyed every single one of them. My favorite though was definitely the cashew butter. I could live off of cashews! I loved that they came in cute little convenient packets and sometimes I grabbed one on my way out the door with a banana that I could enjoy later. Perfect. Other ways I enjoyed these were with some toast in the morning, mixed into my oatmeal (my favorite) and when I was feeling extra creative, I mixed it into my yogurt. Cristina at Vega was so very kind to send me some sample packets of their new shakes. YUM. 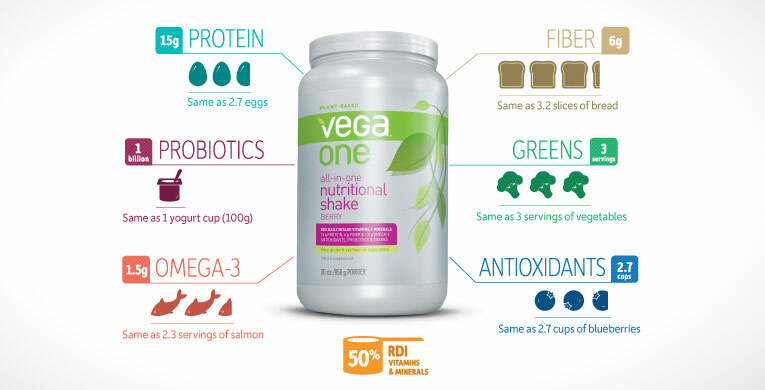 The idea of easy- on the go Vega One shakes, because it tastes better, smoother quality, it’s easier for anyone to shake up and go. Blend it up with one scoop- add your favourite fruit/veg and post the recipe- make for amazing visuals! Conclusion: they are tasty and nutritious and I loved them! If you have yet to try vega products, get on that! You will not regret it. For more info on their products, check out their website, follow them on twitter, and like them on facebook. Happy May everyone! To kick off the month I’ve got a review for you. The lovely people over at Gorge Delight: Just Fruit Bars sent me some to try and review for my readers. These delicious bars are currently available in two different sizes and eight different flavors. A little bit more on the bars themself (from the website)…. I got send a variety pack and got to try all of the eight different flavors. They all tasted delicious! I think my favorite was probably the apple cherry. They combined so nicely into one bar and it was heavenly. There wasn’t one flavor I disliked though! They were quick, easy, and convenient. When I was hungry but not quite ready for a meal, I grabbed one of these and it held me over until I was ready to make a real meal. They were especially easy to grab when I was on my way out the door and thought I should grab a snack in case I needed something when I was out. I almost always had one of these in my bag when I was out. These bars are great and I definitely think you should give them a try! 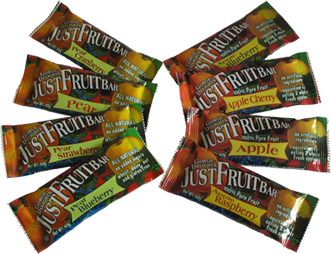 Thank you again to the people at Gorge Delight: Just Fruit Bars for allowing me to try these out, I loved them! You can check out their website for more info on their products. Hey ya’ll. How are you? Lovely I hope. It’s crazy how quickly these weeks are flying by. I’ll be graduated before I know it! 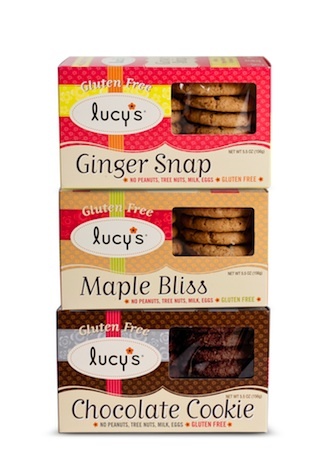 I recently received some gluten-free cookies from Lucy’s to try and review for you guys. Let me tell you, these were a hot ticket in my house. I got to try three new flavors: ginger snap, chocolate, and maple bliss. I loved them all! What I particularly enjoyed about these cookies were that they weren’t too sweet, but they still hit the spot when I wanted something for dessert. They have the perfect crunch & were a fantastic palette-cleanser. For more information, you can check out their website, follow them on twitter, and visit their facebook page. Another foodie pen pal reveal already? Crazy. Thanks, of course, to Lindsay from Lean Green Bean for starting the program! This month, I sent a package to Emily from The Last Corral. I hope you liked everything Emily! I received a package from Kattreena, who doesn’t have a blog of her own but loves to read them. She was so kind & sent me a wonderful box filled with lots of snack items, which was a request of mine. Yum! 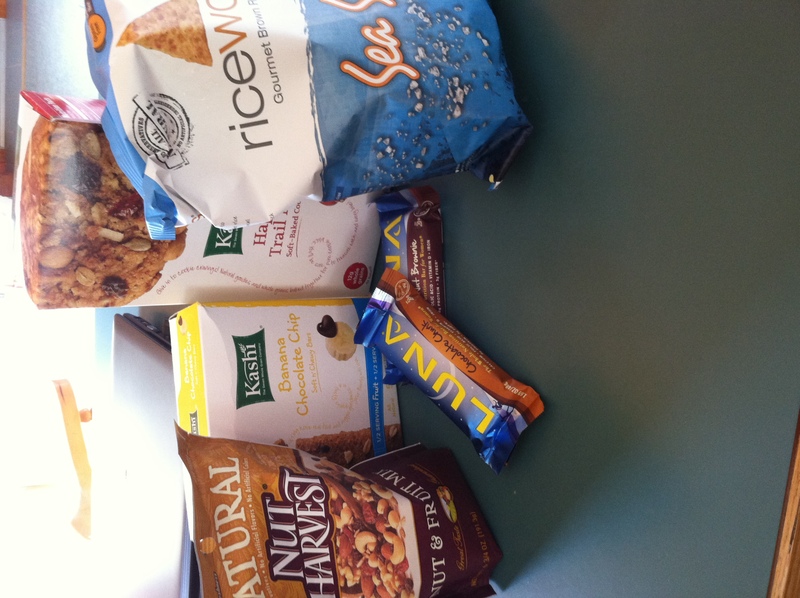 I got some Kashi cookies, sea salt cracker chips, two luna bars, Kashi banana nut & chocolate snack bars, and some nut & trail mix. I shared with Kattreena that I’m always looking for new snack ideas; she did a wonderful job of sparking my imagination! The nut & trail mix was gone so very quickly. 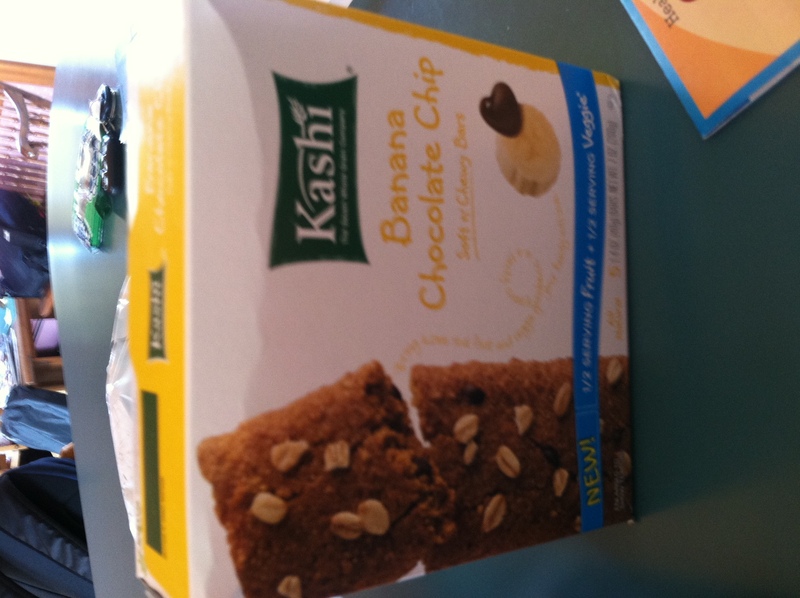 The Kashi cookies have ALWAYS been a favorite of mine and I’ve been loving that box after dinner every night. 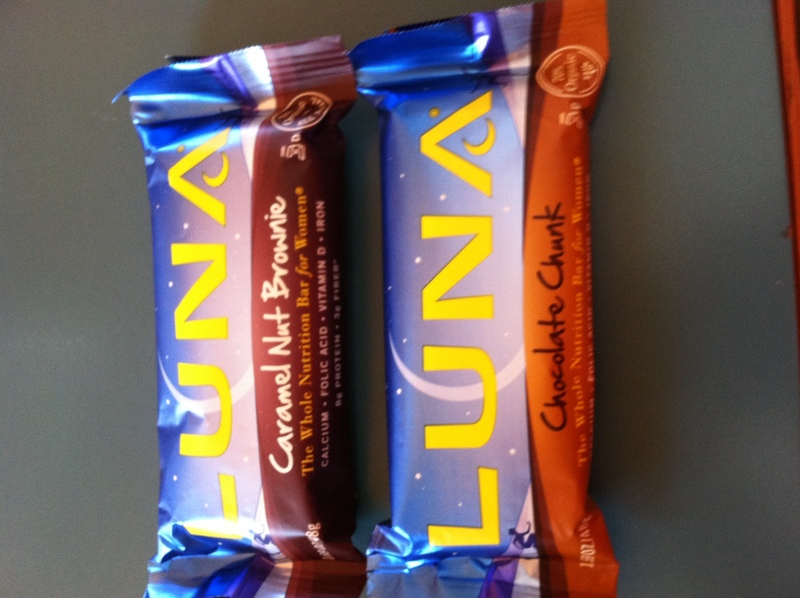 I have yet to try the luna bars, but I can’t wait to do so because they are two new flavors that I haven’t tried yet! 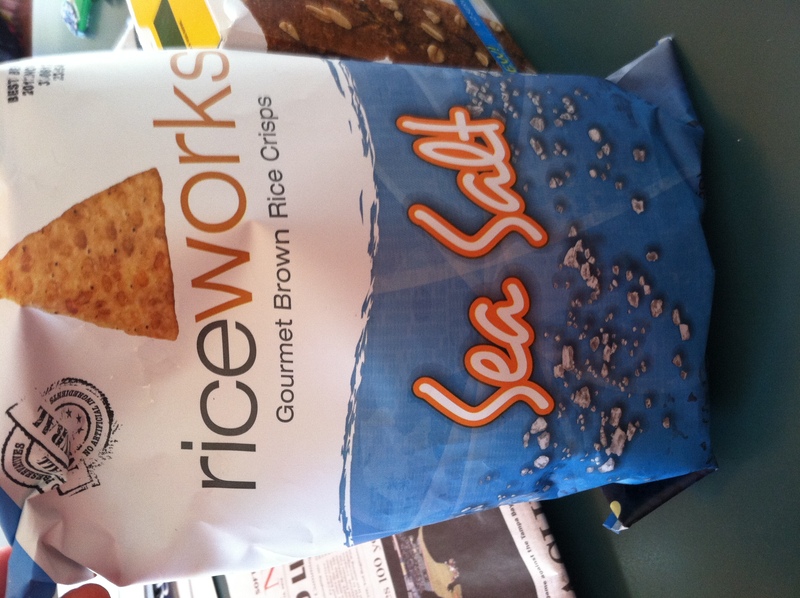 The sea salt crackers were also delicious. They went great with my sandwiches at lunch! And don’t even get me started on the banana & chocolate bars….what could be better? Those were gone in the blink of an eye. I absolutely loved everything Kattreena! Thank you so much for your generosity! -Foodie Penplas is open to US & Canadian residents. Please note, Canadian Residents will be paired with other Canadians only. We’ve determined things might get too slow and backed up if we’re trying to send foods through customs across the border from US to Canada and vice versa. If you’re interested in participating for May, please CLICK HERE to fill out the participation form and read the terms and conditions. *If you’re from somewhere besides the US, Canada or Europe and want to participate, send me an email and I’ll see if we get enough interest this month! Suprise, suprise…another review! I recently tried Organic Food Bars & I’ve got some good news for you today. These are SO TASTY. While browsing the Organic Food Bar website, I found out exactly how these bars are made & was intrigued…..
It’s refreshing to read that because it proves that these aren’t just another processed bar. 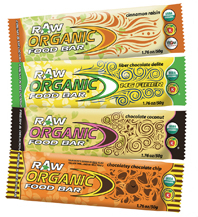 The company offers several different types of bars and I was lucky to be sent the Raw Organic Food Bar. I got to try the chocolatey chocolate chip, fiber chocolate delight, chocolate coconut, and cinnamon raisin. They were all absolutely delicious. And good news, I’ve actually heard of all the ingredients in these bars. That’s a HUGE plus. No fake stuff! I had these for on-the-go snacks, dessert, and even with my lunch sometimes. Perfect for multiple different occasions! I loved that they were raw too. These were so good that I would definitely be interested in trying some of the other types of bars they create, the omega 3 flax bars they offer look great. All in all, I thoroughly enjoyed these and I hope to get my hands on more soon! For more information on Organic Food Bars, you can visit their extremely informative website and follow them on twitter. Hi all! know I briefly mentioned that I’ve been super busy these past couple of weeks & that has been the reason for my absence! It’s often hard to get all my mandatory stuff for the day done AND find time to post. Now that my high school classes are officially done (AH) I will have plenty of more time to get back to blogging! I thought a good way to get back into the swing of things was to post my spring goals. 1. Set a new school record at my high school for the two mile This will definitely be a challenge, but it’s something I’m going to try really hard to accomplish. I know that I’ve put a lot of hard work in over the winter and I have a good base that can help me cut down a lot of time off of my current PR. It’s my last season of high school sports EVER, and I’m ready to go out with a bang. 2. Listen to my body This is a constant goal of mine, but something I’m going to try to work extra hard at this spring. I feel like sometimes I eat when I’m not hungry AT ALL, just simply bored. I get frustrated because my mind is hungry, not my body and it often messes up my real hunger cues. But nobody is perfect, right? Just sometime i’m going to work on. 3. Volunteer at a food shelter I’ve been wanting to do this for so long and I just haven’t gotten around to it. If I am more proactive and actually start to research somewhere I can go to help out, I know this can be easily done. I’ve done it once in the past and the experience was extremely rewarding. 4. Go on a budget This one is extra important. I’m going to college next year and I just can’t afford to be spending money on things that aren’t essential. Yes, panera is good once and awhile. No, panera is not good two times a week. I have to be more strict about this one, it sure is easy to slip. Note to self: I want that shirt, I don’t need that shirt. 5. Don’t sweat the small stuff Sometimes I feel like I worry too much and over-analyze certain things. While it’s good to be conscious of stuff, it’s not good to freak out about small little things that won’t matter in the long run. What’s meant to be will be. 6. Get more creative with meals While going through the blogs I read daily, I’m always envious of how creative everyone’s meals are! I think I want to start experimenting more and trying some new things. A pb&j sandwhich for lunch is getting real old. Since I’m out of school for good in just FIVE days, this will be easier! I’ll be home for lunch and won’t have to rush out the door with breakfast to go at 7 in the morning. I’ll certainly by doing some recipe hunting the next couple weeks. 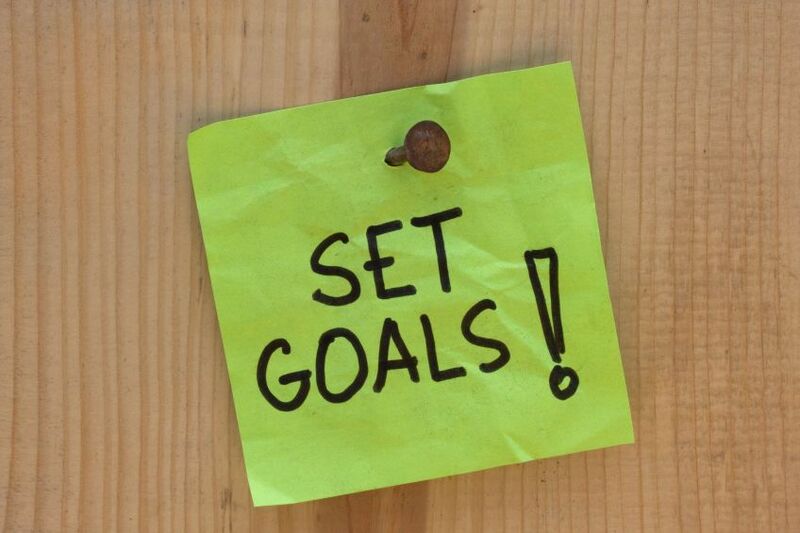 If I work hard, I know that each and every one of these goals can be accomplished. I’m looking forward to a great senior spring! Do you ever set goals for yourself? How do you try to accomplish them? ALSO! 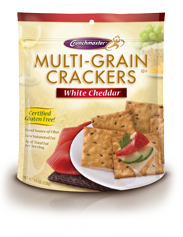 GO ENTER MY CRUNCHMASTER CRACKERS GIVEAWAY! Hi friends! Has anyone ever heard of Perfect Food Bars? If you haven’t, I’m about to tell you all about how fantastic they are. Wendy at Perfect Food Bars was kind enough to send me a sample pack of these bars to taste and write a review for all of you. I can’t even try and tell you how good these are. After just taking ONE bite of the first flavor I tried (peanut butter, of course) I fell in love. They are SO different from any other bar. They don’t taste processed and are not filled with artificial flavors or refined sugars. They are REAL and packed with nutrients. I had one of these for a meal one day because my appetite was sort of off and it kept me full & satisfied for hours. I also split it and half and had it for dessert another time. The possibilities are endless. There are five different flavors: peanut butter, almond butter, fruit & nut, carob chip, and cranberry crunch lite. I would try to tell you which one is my favorite, but they were honestly all SO delicious that I just can’t decide. Their website has a great list of ten reasons you should try these bars…. 10. Simple Ingredients. Real Food. You can pronounce all of the ingredients without a chemistry degree. 9. Over 20 nutrient dense organic whole foods provide good vitamins and minerals on-the-go. Plus, with ingredients such as tomato, bell pepper, alfalfa and celery, you will finally be able to tell your mother that you’re eating your vegetables! 8. No Refined Sugar. Since the only sweetener we use is organic honey, your body can digest it slower than it would refined sugar. This means you’ll have long sustained energy without a crash. 7. Good source of fiber. Everyone knows fiber is important and aids in proper digestion. 6. Soy free. Research suggests soy consumption might be linked to several health conditions including: bloating, hormonal imbalance, unusual weight gain, and allergies. (Hidden Dangers of Soy by Dianne Gregg.) The problem with soy is that most products you find at the grocery store have some form of this ingredient – you have to know what to look for because it’s hidden in so many ingredients. 5. Handmade. These bars are handmade by happy people in sunny San Diego. We create jobs and support our local community. Besides, robots are kind of scary. 4. High in Omega-3s. Anti-inflammatory omega-3s are an important addition to your daily diet. 3. Gluten free. Whether you’ve been diagnosed with celiacs or have found that your body doesn’t digest gluten very well, we are committed to being gluten-free. We encourage everyone to read more about the ill effects of gluten on your body’s digestive system. 2. Refrigerated. Because there are no artificial ingredients or chemical preservatives these bars are stored in the fridge. Yum! 1. They taste amazing. PERIOD. Seriously, you really won’t even remember the 9 other reasons once you try a bar. They taste like cookie dough, but are packed with the nutrients your body needs to stay active! I agree with every single one of these reasons. These are the perfect bars & I HIGHLY recommend them! Thank you so much Wendy for sending me a sample box, I will for sure be ordering more. ALSO, make sure you check them out on twitter & facebook! Hello friends! I am so sorry I’ve been absent from the blogging world. I’ve got SO much going on and have been struggling to find time for everything! It’s looking as if things are finally slowing down a bit so hopefully I will be posting more often these days. I hope you are all doing well! As an apology for my absence…I’ve got another giveaway! This time its Crunchmaster Crackers. “It’s not so much what’s inside our crackers as what’s not inside. At Crunchmaster, we believe in keeping our products simple and real. We don’t put in any artificial flavors, preservatives or other icky stuff. 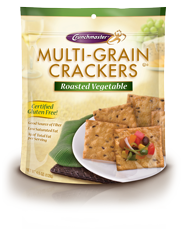 Crunchmaster was kind enough to send me a few different types and flavors of their crackers to enjoy and review. They also want to reward one of my readers with some crackers for themself. Hoopla! 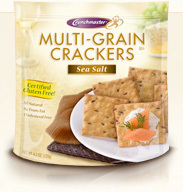 I got to try their sea salt, roasted vegetable, and white chedder multi-grain crackers. I loved all of them! I mostly enjoyed them as a side with my lunch. They went great with a peanut butter & jelly sandwich I tell ya. They’re all-natural, gluten free, vegan/dairy free, and have no saturated fat. 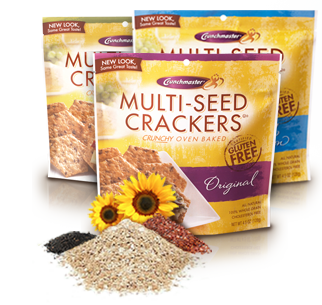 They also offer over 20 grams of whole grain per serving. Oh and by the way, they taste delicious. Sometimes I would have them plain and other times I would eat them with peanut butter, cheese, or humus. Not only was I a fan of these, but everyone in my family was too! These were gone VERY quickly. I 100% recommend Crunchmaster crackers and I definitely plan on buying more. Want to win a sample pack of your own? The giveaway will last one week and the winner will be announced on Sunday, April 29th. Hi! I'm Lily. I'm a senior in high school with a passion for running and living a healthy lifestyle. As an avid athlete, food is fuel! I created this blog as a way to get my thoughts out and discover new things about myself that I never knew before. Thanks for stopping by, enjoy! Follow Eating For Excellence via Email? !